Bike Week 2012 is Here – Free Events All Week Long! Bike Week 2012 is finally here! 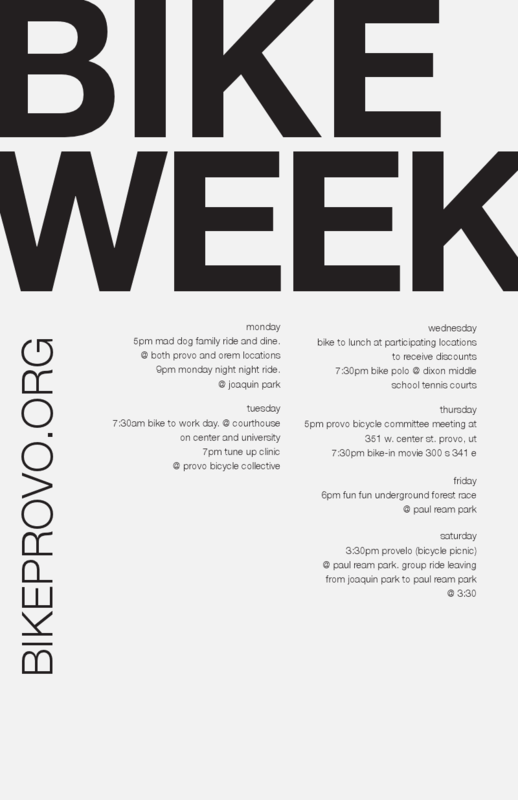 Come celebrate with us all week long by participating in unique Provo cycling events including a morning ride with Mayor John Curtis, a bike-in movie, a free bike tune-up clinic, bike polo, rides and races, and our kickoff Provelo bicycle picnic (one of many to come this summer). Click on the flier above or check out our facebook event for more information. We’ll also be posting the details here on bikeprovo.org all week, so keep checking back for updates and photos. This entry was posted in Local Biking Events, Provo Bike Week by Jamie. Bookmark the permalink.